I was expecting a bigger version of Christchurch and found a smaller version of Melbourne, complete with giant sports stadiums downtown, a vibrant arts scene, a river side setting, beautiful heritage buildings and funky modern architecture. I only had about thee hours to explore the place but I’m a quick explorer, and expect to return sometime. To be honest my first impressions were not great. First I drove along South Road on my way to Wilpena Pound, which made Auckland’s Great South Road seem charming in comparison (which it really isn’t). On my return to Adelaide I walked in the rain and cold from the station to the YHA quite uninspired. It was amazing the transformation sunshine and finding the right parts of town brought though, as I excitedly explored the CBD and wandered along by the Torrens River. 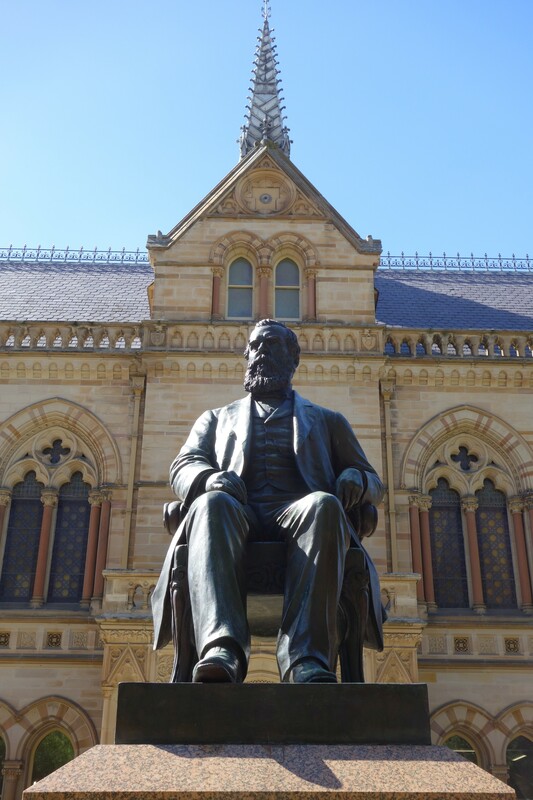 I hit payday on North Terrace, from the original and newer Parliament buildings along to the University of Adelaide, so many beautiful colonial heritage buildings, and I found more elsewhere later on. North Terrace was also home to a number of war memorials, with WW1 having it’s usual prominence over other wars. I loved the Art Gallery of South Australia, with it’s fascinating and varied collection, housed in a beautiful building, compete with the usual modern extension to house the cafe and shop. Modern art had been let loose in some of the traditional rooms, including dead horses, nailed statues and the disturbing dioramas of the Chapman Brothers. There were also interesting pieces from Asia, and haunting work from Australia’s display at the last Venice Biennale. There was plenty of modern architecture in the CBD, a mixed bag as ever with glass prominent but some attractive buildings. The Torrens River provides an pleasant setting in the middle of the city. Across the river from the CBD are the typically Australian huge sport stadiums of the Oval, not far from the Cathedral. Heading into Botanic Park the trees were full of bats. The Botanic Gardens were lovely, with an impressive modern greenhouse containing a tropical rainforest, but I preferred the gorgeous Victorian style Palm house.